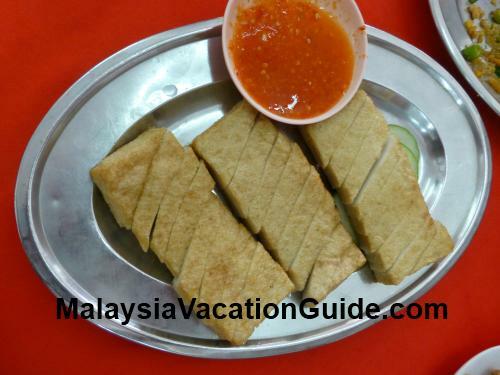 If you are thinking of eating something different from normal, head for Ijok town in Selangor and look out for New Beggar's Delicious Restaurant. 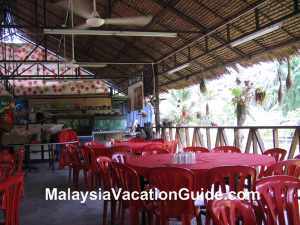 This restaurant is about 45 minutes drive away from Kuala Lumpur using the coastal road to Kuala Selangor. 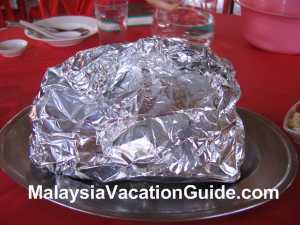 The specialty of this restaurant is chicken stuffed with herbs wrapped in aluminium foil and is then covered with clay before being baked for 4 to 6 hours. The entire chicken is submerged in the open brick oven located behind the restaurant. 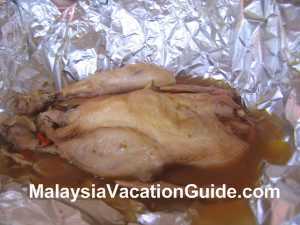 The chicken and herbs wrapped in aluminium foil. The nicely cooked beggar chicken. 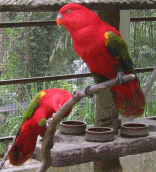 The main chinese herbs used include "kei chi" or wolfberries and dong kuai. 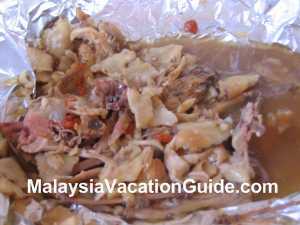 Other dishes that are baked include the pork knuckles, duck, glutinous rice and pig stomach soup. 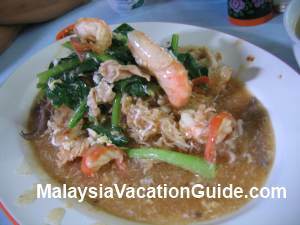 Other dishes serve besides these specialty dishes are prawns, fish, crabs and vegetables. The fish is taken from the pond nearby that belongs to the owner, Mr. Tee. 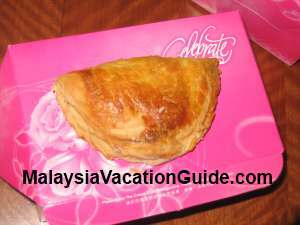 As it takes quite a number of hours to cook these dishes, you will have to book the dishes in advance. Usually a set for 10 people is preferred although lesser number will have to go for ala carte. 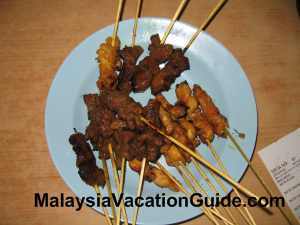 The price of the beggar chicken is RM45 and begger rice costs RM35 as of June 2011. Price usually go up in tandem with the inflation of the country. 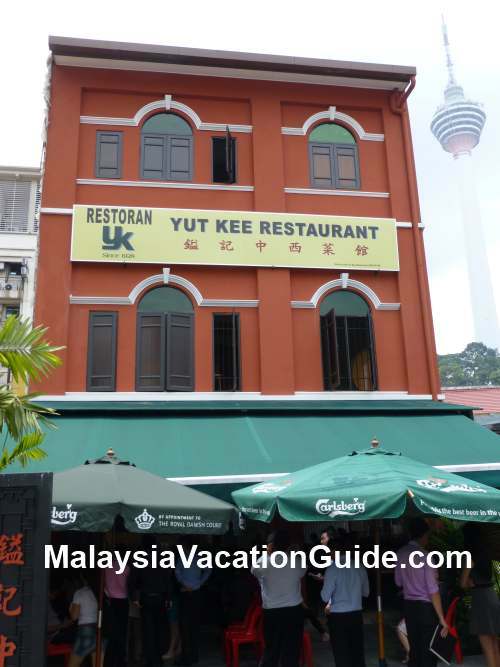 A set meal for 10 persons costs RM368. The abundance of herbs used in the baking of the chicken. 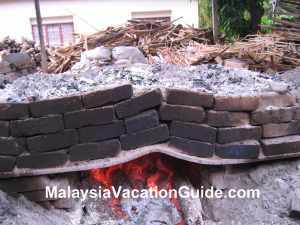 The traditional and manually maintained oven used to bake the chicken. 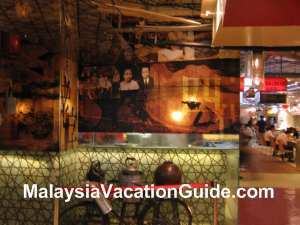 One other information to take note is that the restaurant is only open on Wednesday, Saturday, Sunday and Public Holidays from 5pm onwards. Advance order is a must to avoid disappointment. However, if you did not book and happen to be around on these days, you may want to try going in. 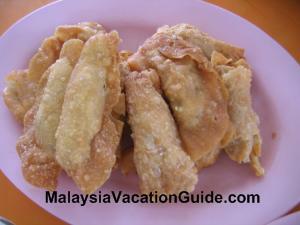 There is a possibility that you may be able to taste the beggar's chicken if there is less crowd. Clay to be used to wrap the chicken before being baked. 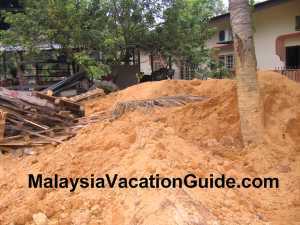 If you are coming from Kuala Lumpur, head for Sungai Buluh and follow the direction to Kuala Selangor using the coastal road. 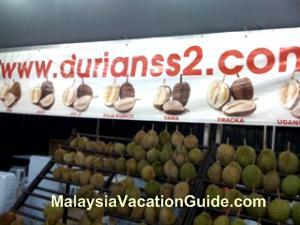 The other alternative is to go to Guthrie Corridor Highway and follow the signage to Kuala Selangor. You will see a signage "New Beggar's Delicious Restaurant" to your left before reaching the town. Turn left and follow the road to the restaurant 1 km down the road. Open-air restaurant is usually crowded during the weekends. Exterior view of the place. Tel: +6 03 3279 1936 or +6 019 317 3687.